This novel fiber optic Raman probe (US 9134177B2) makes use of a sapphire fiber to deliver the excitation laser light and collect the Raman signal. 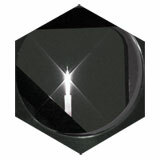 The crystalline sapphire produces two sharp Raman peaks whose magnitudes vary in direct proportion to those generated by the sample. Thus, they serve as a built-in reference which can be used to correct for laser power fluctuations and variations in the coupling efficiencies of the connecting fibers (both input and output). Furthermore, the large thermal conductivity of sapphire makes the probe head an effective heat sink, as well. 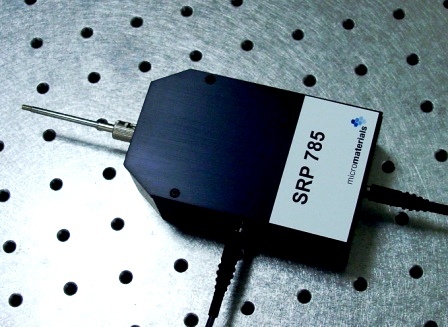 The standard model for the probe is fitted with 785 nm optics (SRP785). Custom units at other popular excitation wavelengths are also available. Sapphire fiber probe heads with lengths ranging from 5 cm to 30 cm can be provided. Please contact us for further information.